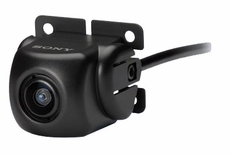 See what is behind you as you reverse your car, truck or SUV with this rear view camera. It's designed for use with compatible Xplod� car audio units. Improve your view while backing up and see what's behind you with the XA-R800C rear view camera. Ideal for larger trucks or SUVs, this convenient rear view camera solution offers flexible mounting options with adjustable tilt, and features 138 degrees horizontal and 92 degrees vertical viewing area for increased visibility. Compatible with select Xplod� car audio units. Convenient rear view camera for audio/video centers, reverse light signal input for auto-switching with compatible units. 138 degrees horizontal and 92 degrees vertical viewing area. 1/4" color CCD sensorlens with 16:9 aspect NTSC mirror image, 75 ohm output. Flexible mounting options with adjustable tilt, 3M camera cable and 5M video cable. Pyle (PLCM21) License Plate Rear View Backup Camera ''Zinc Metal Chrome"